Hello hello there! How was your weekend? Good, I hope! Saturday marked the end of the school year here and beginning of summer vacation! Luckily the day was sunny but oh so cold! I'm so hoping the real summer will start soon - there's even snow on the ground up north! But what I wanted to share with you today is a sneak of something I made as a special guest to the Nathalie Kalbach's Artful Adventures Stroll challenge. The experimental project comes with a tutorial and the piece has a "growth" theme as that's the prompt for today. If you are yet not familiar with the Artful Adventure in mixed media, here's a link to Nathalie's blog (link) about making the book and here you can find it at Amazon (link). Yes, it's her brand new book on mixed media! 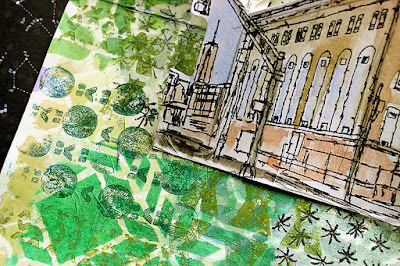 It's also a free online class with inspiration, tutorials and ideas to boost yoour creativity. If you haven't joined the free class yet, you can still do it. Here's a link to the instructions (link). Hope to see you in there!